If you can’t drag them away, can you pay people to take them away? Spanish explorers are credited with first introducing horses to North America in the 1500s. The 83,000 wild horses and burros that currently roam 27 million acres of western public land are descendants of those first American equines, which came to symbolize the pride and wildness of the West. Many of the animals escaped from or were released by those early explorers or, later, by Native Americans, the U.S. Cavalry, or western ranchers. As homesteaders and public land management agencies spread westward over the centuries, they either drove out or killed wild horses that competed with them for pasture and forage. By the 1970s, in response to concerns from horse advocates about the future of the animals, President Richard Nixon signed the Wild Free-Roaming Horses and Burros Act into effect, directing the Bureau of Land Management to manage and protect wild horses and burros. Today, there are simply too many horses and burros on too little range. With federal protections and no natural predators, the populations of the free-roaming animals have skyrocketed. In many areas, mustangs overgraze to the point that there is no forage left, meaning they literally face the prospect of starving to death on public rangelands. Vegetation and water sources are being depleted from Oregon down to Arizona, and native species such as elk and sage grouse are being displaced. 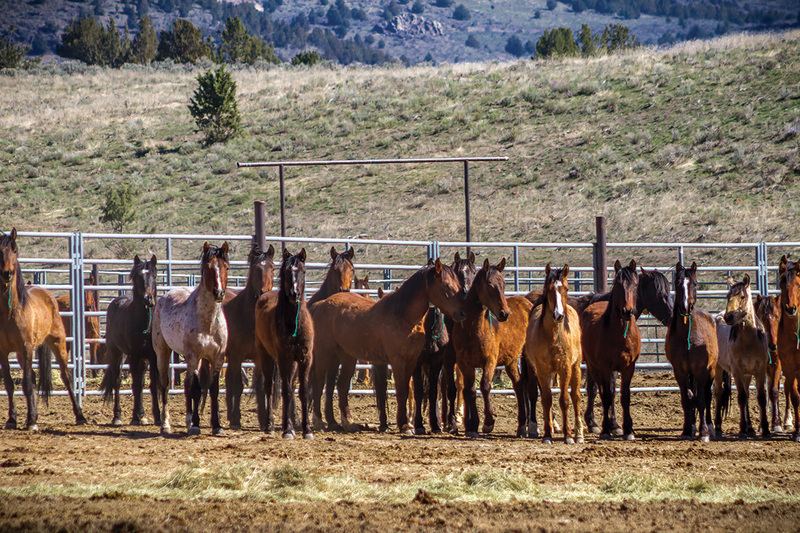 The BLM sets an appropriate management level for wild horses based on the amount of rangeland available, a figure that currently stands at 27,000 animals. But current populations are more than three times that designated carrying capacity—and are on pace to double every four years. Today, there are simply too many horses and burros on too little range. With federal protections and no natural predators, the populations of the free-roaming animals have skyrocketed. 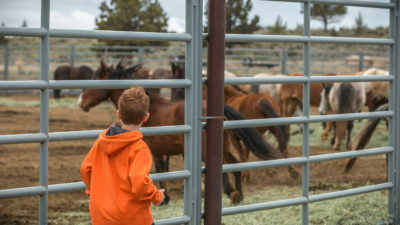 In an effort to prevent the demise of both wild horses and rangeland ecosystems, the BLM has resorted to gathering excess animals and moving them to off-range corrals and pastures. The agency offers these horses and burros up for adoption to good homes using auctions, but it requires interested adopters to pay a minimum bid of $125. Though this approach has had a degree of success, nearly 51,000 horses and burros remain in off-range facilities. According to the BLM, the lifetime cost of caring for a single horse in one of these facilities is approximately $48,000. The total annual cost to taxpayers for the holding facilities runs to $50 million—or more than half of the entire Wild Horse and Burro Program budget. The agency has explored using permanent sterilization or even euthanasia as alternatives to wrangle in the horse populations, but political divisions on the issue have prevented implementing these techniques. One way to ensure horses neither starve to death on the range nor cost taxpayers exorbitant amounts in off-range facilities is to get more of them adopted into private homes. Last spring, the BLM proposed an innovative approach to do just that: flip the auction script. In a report to Congress, the agency suggested paying potential adopters $1,000 to take in a horse or burro. The idea of using incentive payments to achieve sustainable wild horse and burro populations is one that’s been researched by PERC fellows Randy Rucker, Tim Fitzgerald, and Vanessa Elizondo. “Why are taxpayers shelling out $50,000 a head to care for horses whose value is so low that no qualified private horse buyer is willing to offer $125 for one?” they’ve asked. Their research suggests that a $100 payment from the BLM to adopters would likely have been enough to ensure almost all of the animals in long-term holding facilities over the past several decades would have been adopted—a potential savings to taxpayers of $450 million. The Bureau of Land Management has decided to implement this idea on a trial basis in 2019. The agency will pay adopters a $500 first installment 60 days after adoption, once new owners have demonstrated that they’re providing quality homes. After a 12-month probationary period to ensure the adopted animals are being treated well, owners will receive title to their horse or burro, and the second $500 payment will follow 60 days after the title transfer. The plan has the potential to help improve the lives of wild horses while also benefiting taxpayers. Owning and caring for a horse is not cheap. The $1,000 payment should promote adoptions as the stipend can help cover veterinary and training costs. This sort of approach has been widely used by animal shelters that offer free adoptions or waivers for veterinary care to help get pets placed in loving homes, and it has potential to make a real difference in the lives of wild horses and burros. Adoption is clearly a better outcome for a wild horse than starving on the range or living out the rest of its days in an overcrowded corral. For taxpayers, the per-horse savings is undeniable. Spending $1,000 to find a mustang a good home is orders of magnitude cheaper—and likely much more humane—than caring for it in a government holding facility for the rest of its life. In addition, taking horses and burros off public rangelands can alleviate major pressures on western ecosystems. Solving the wild horses crisis will allow vegetation to regrow and land to recover from overgrazing, reducing competition for forage and water among other wildlife. Wild horse and burro management is an issue fraught with emotion and complicated by biological and political concerns. But it’s clear that the status quo is failing horses and burros, public rangelands, and taxpayers alike. The saga of the wild horse in America may be playing out in the New West, but it follows a well-worn theme—competition over scarce natural resources often leads to conflict. Paying ranchers, families, or other willing parties to adopt wild horses and burros is a step toward reining in the problem in the 21st century. Hannah Downey is the policy and partnerships coordinator and a research fellow at PERC, helping to bring PERC ideas to the policy world.